It’s the cold truth – winter is officially here. So we brought back our special MN Ice Daze weekend to help you celebrate life, family and outdoor, winter fun. As seen on WCCO’s 2013 “Goin’ To The Lake,” news anchors Frank Vascellero and Chris Shaffer made a pit stop at Grand View Lodge and took in all the weekend had to offer. Click here to see last year’s Ice Daze and read below for what we’re offering again this year in 2014. To kick off the 2014 Ice Daze weekend, we will be offering our weekly wine tastings featuring Oregon and Washington Wines. Enjoy this informal hour of vino education, plus receive a certificate to use in our restaurants for a glass of your favorite wine you tasted during the tasting. If you want a unique night with the kids, check out our Dive-In Movie at the pool, which can be a blast no matter what your age. Float on your own innertube with your friends and family while watching a movie on the big screen. Complimentary Inner tubes, pizza and popcorn will be provided. But if you prefer to stay dry, swing by the Northwoods Pub for live music both Friday and Saturday evening. Saturday morning, enjoy an endless Breakfast Buffet, before you venture out for several fun activities such as our Grand View Wellenss Yoga, or Cross-Country Ski Clinic, Broomball, Dog Sled Rides and Pond Hockey. After noon bells, join us at our annual Guest-Only Fishing Derby. Our three-hour derby will give you a chance to catch some tales and land some big prizes. Fishing holes will be drilled for you and your fishing poles, tackle and bait will also be provided, all at no cost to you. Refreshments and hot dogs will be complimentary, but beer will be an additional charge. Following the derby will be the Ice Daze Olympics, offering families and individuals competition in categories such as Ice Trike Racing, Chip It to Win It, Human Curling, a snow sculpture contest and more. To top off the weekend is our annual KFAN’s Common Man’s Snowmobile Poker Run on Sunday morning. Five stops throughout the miles of perfectly groomed trails in the Brainerd Area and receive 5 poker cards to get the winning hand for several great prizes. If you don’t have a sled of your own, our friends at Boats ‘N Beyond Rentals have available rentals, plus all the gear at a special price for our guests. After the long journey, head indoors to warm up at Northwoods Pub and enjoy our annual Superbowl Party. Enjoy a Football Lover’s Buffet, trivia, specials and fun. Plus you can watch the champions of the NFL season battle for the coveted title. Our MN Ice Daze package is $140/night based on double occupancy. Add $50/additional adult or $10 per child per night for a weekend of fun, music and celebration. It’s Minnesota – time to embrace the season and discover, learn and share. Sugar and spice and everything nice, that’s what Minnesota winters are made of! To celebrate this, Grand View Lodge is introducing, MN Ice Daze, a weekend dedicated to families and a tribute to winter activities. Starting Friday, February 1, we will have our Dive-In Movie at the pool, where no matter what your age, you can relax and float around on inner tubes and enjoy a movie on our big screen. If its outside you’d rather be, then try a ride on our lighted tube down the Grand View hill in front of the Main Lodge. Snow is essential for this, so let it snow, let it snow let it snow! The evening of fun will end with the awesome acoustic sounds of Minneapolis’ own Tim Mahoney (former 2011 contestant on NBC’s The Voice) joined by musician, Michael McGregor, at our Main Lodge both Friday and Saturday nights. Upon filling yourself at our endless Breakfast Buffet, join us at our Guest-Only Fishing Derby. Our three hour derby will give you a chance to catch some lunkers and land some big prizes. Holes will be drilled for you and your poles and bait will be provided. But if you prefer your lucky pole and secret bait, bring that along too. There will also be refreshments and hot dogs will be complimentary, but beer will be an additional charge. Following the derby will be the Ice Daze Olympics, offering families and individuals competition in categories such as Ice Trike Racing, Chip It to Win It, Human Curling, a snow sculpture contest and more. If you haven’t decided to stay for our Sunday celebrations yet, maybe we can persuade you with the following…. We will start off the morning with KFAN’s Common Man’s Snowmobile Poker Run. Five stops throughout the miles of trails in the Brainerd Area and receive 5 poker cards to get the winning hand for the big prize. If you don’t have a sled of your own, our friends at Boats ‘N Beyond Rentals have available rentals, plus all the gear at a special price for our guests. And then it begins, our SUPERBOWL Party at the Northwoods Pub. Join us for a Football Lover’s Buffet, trivia, specials and fun. Watch the Vikings (oops, we’ll see), the champions of the NFL season battle for the coveted title. We will still have the sledding hill open if you feel the need for snow speed and fun or to join the kids outdoors for one last day. MN Ice Daze package is for $140/night based on double occupancy. Add $50/additional adult or $10 per child per night for a weekend of fun, music and celebration. Because in Minnesota, sometimes you have to embrace the season and here’s a weekend of reasons why! Last years festivities included Martin Zellar and the Hardways! The third annual KFAN GOLFtoberfest sponsored by Schell’s Brewing Company, Grain Belt, Buffalo Wild Wings, Boats n Beyond Rentals, Ticket King, Gopher Sports, and Chipotle will be held October 12 -14 at Grand View Lodge and its three championship golf courses – The Pines, The Preserve and Deacon’s Lodge. The fun-filled weekend includes deluxe lodging, breakfast daily and unlimited golf with carts at all three courses. Also included in the package is the Saturday night party, which includes FREE food, drinks, giveaways, and a FREE concert performed by Rocket Club, the Minneapolis-based band who recently performed at the 2012 WE Fest this last August. Mother’s Hotdish, featuring Mark Mraz and George Scott Mckelvey, will open the 5-hour music filled evening. This whole weekend package is only $299 per person. 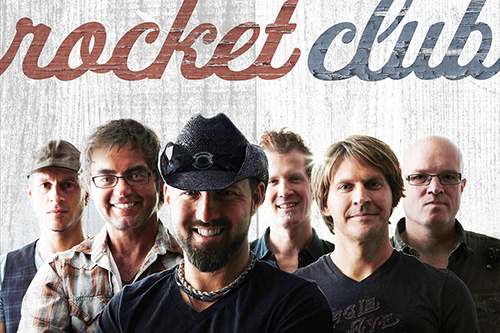 KFAN Chris Hawkey’s band Rocket Club will be the headliner at the show! Check out their latest single “North Country” on YouTube. If you’re not a die-hard golfer, there are non-golfer package rates available. And if you’re looking for just a fun night out, the concert is FREE to the public. 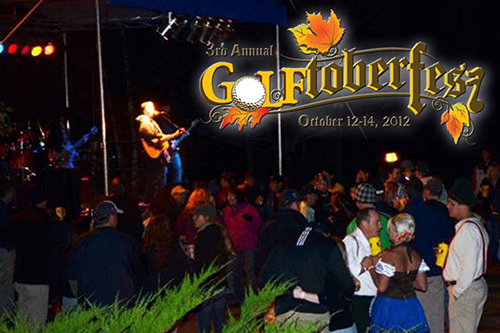 The only cost involved will be food and drinks for those not on the GOLFtoberfest package. We welcome you to join us in this weekend tribute to golf and celebration of music and fun. NOTE: If you want to stay one more day, Sunday is our $49 per person Overnight Tailgate Party which features an extra night of deluxe lodging, breakfast and huge party in the Northwoods Pub for the Vikings game at 3p.m. and the Packers game at 7p.m. Food and drink specials will be available, PLUS each person on the Tailgate Package will have a chance to win 4 lower level tickets Vikings vs. Packers home game in December (Drawing will take place at 6 p.m.).